A large crowd was in attendance to watch the game as the RAMS were quickly into their stride showing ambition out wide. A laboured backs move from Seaford just inside their own half saw RAMS player/coach, Jim Taylor, nip in for the intercept and outstrip the defence for a try which he converted for 7-0. Seaford set out their stall from the restart and proceeded to use their big forwards to pick and go and obtain territory with some success, but it wasn’t until 25 minutes in that they gained any reward with a penalty for 7-3. The RAMS roared straight back with quick hands giving Dougie Kern space to step past three defenders and score in the corner for 12-3. Seaford reverted to pick and go and when the space came used a cross field kick to score in the corner for 12-8. More forward grunt from Seaford was followed by another accurate cross field kick to the opposite wing, where the RAMS defence was deemed illegal by the referee, who awarded a penalty try - meaning Seaford took a narrow half time 12-15 lead at the break. In the second half Seaford stretched their lead further to what looked like a match winning position with a try and conversion for 12-22. However this time it was the RAMS who stormed back with a quick tap penalty from skipper Dan Shotton who made valuable yards before the ball was moved wide for Kern to score his second and close the gap to 17-22. 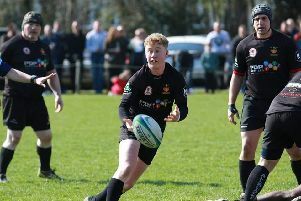 It was now the RAMS who were dominating possession but unable to get over the line despite a series of lineouts and scrums only five yards out. Then came the defining moment of the game when a kick through from the RAMS saw the Seaford 10 make a late, off the ball tackle and receive a yellow which took him out of the equation for the rest of the contest. Taylor kicked to the corner and after various phases with just three minutes remaining Shotton crashed over to tie things up at 22-22. The conversion was far from straightforward but Taylor stepped up and knocked the kick through the uprights for 24-22 and an invaluable lead for the RAMS. Seaford worked their way back into the RAMS danger zone and, with the referee calling last play, earned themselves a reasonably straightforward kick at goal for the match. However without their binned goalkicker the opportunity wasn’t quite so clear cut and the kick ricocheted off the upright and into the arms of Shotton who kicked the ball dead for the final whistle. An epic encounter and spellbinding match from both teams. The win was just reward for a great season for the RAMS squad who have stuck together despite a league campaign littered with cancellations and limited opportunities to play competitive fixtures. As Heath RFC look to develop more strength and depth in their senior squad they are always looking for new players of all abilities and experience so if you would like to join them next season email rugby@hhrfc.co.uk for more information.